SPFT President Nick Faber speaks at a press conference in the library at Galtier Community School, where he did his student teaching 31 years ago. Members of the St. Paul Federation of Teachers will not strike tomorrow, but they aren’t walking away from the fight for fully funded, racially equitable schools. After 13 hours of mediated talks that began Sunday, union and district negotiators reached tentative agreements on three contracts covering SPFT’s 3,700 members early this morning, averting a strike. Details of the agreements are not yet public. 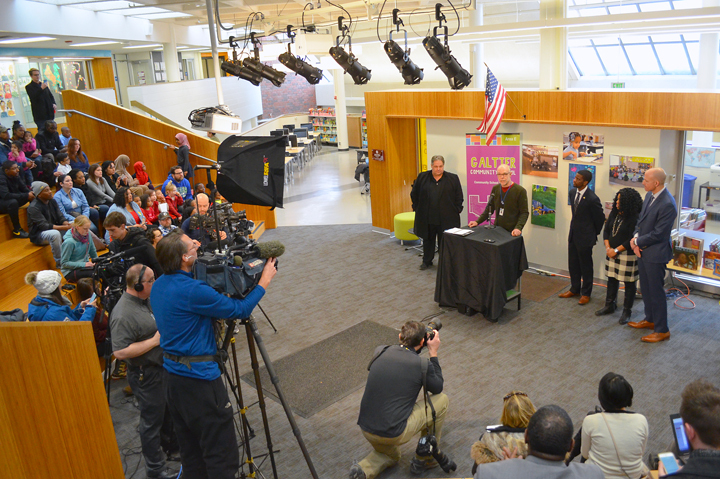 During a press conference at Galtier Community School this afternoon, union and district leaders said collaboration was key to reaching common ground at the bargaining table – and will remain critical as the two sides carry forward their work to tackle funding shortfalls facing the St. Paul Public Schools. Collaboration could involve lobbying together at the Legislature or partnering in efforts to recruit new students, Gothard and Faber said. It might also mean working jointly on a levy referendum or other potential revenue sources. The mutual commitment to raising revenue – whatever approach it takes – is a victory for SPFT, which refused to allow scarcity to dictate contract negotiations despite the district’s projected budget shortfall. Instead, union proposals took aim at creating fully funded schools staffed with nurses, librarians and social workers, with smaller class sizes and expanded preschool and family-engagement programs. To realize its vision, SPFT called on the district to join its members in pressuring tax-exempt large nonprofits and corporate tax dodgers to pay their fair share. The groundbreaking approach drew national attention and sparked public debate likely to outlive the next bargaining agreement. “We consider that a win,” Faber said. SPFT’s bargaining team, meanwhile, said the proposed contracts for school and community service professionals, educational assistants and teachers make progress on several of union members’ top priorities. Although both sides struck a conciliatory tone at the press conference today, negotiations between SPFT and the district were the most heated in years, with union members voting overwhelmingly Jan. 31 in favor of authorizing a strike. Faber called the strike authorization “an awesome responsibility and an awesome piece of strength” in negotiations. SPFT will hold informational meetings with members about the contract Thursday, and the union expects to hold a ratification vote early next week.